The Harlequins will celebrate their biggest day of the season with the annual Back to Campbelltown day this Saturday. Harlequins and Camden will play in the second round of the local derby but the big day will begin at 11am with the Colts playing on the top field. At 12.15pm the ladies will play Blacktown on the top field and at 12.20pm the third grade will take on Camden. It will be a 1.30pm kick off for second grade between Quins and Camden on the top field, while the Old Jokers match will be played on the bottom field. The day will finish with the first grade local derby up against Camden on the top field. Once that’s finished there will be live entertainment at the after match function. Last Saturday the Harlequins hosted Bowral in the Illawarra Rugby Premiership competition. Bowral only field first and second grade teams, so third grade Harlequins enjoyed a bye, while the Colts travelled across town to Camden. ♦ After leading for most of the game Harlequins colts ended the day with a 19-all draw. Tries went to Sau Toafia, Elijah Sa and fullback Rod Mapa and man of the match was Devlin Taula. ♦ The Quinnies second grade played another strong game against the Bowral Blacks and in a five tries to two effort won 36-12. Tries were scored by prop Rick Flaxman, halfback Gregor O’Mara (2), centre Anthony Soloi and winger Wise Raitalia. Rick Flaxman kicked three conversions and O’Mara was named man of the match. 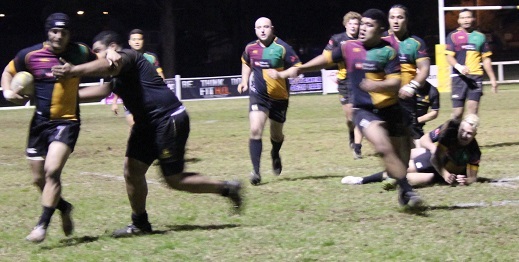 ♦ Harlequins first grade struggled against a committed and enthusiastic Bowral side. Bowral took the game by the horns and managed to upset the home side 29-27. However the Harlequins came away from the match with two bonus points after scoring four tries. Tries went to prop Alex Sherwin, lock Ashley Hanthorn, centre Halatoa Havea and wing Malakai Fukofuka. Halfback Mitch Gordon was named man of the match for Harlequins. ♦ The Harlequin girls had another great result scoring an equal number of tries as their opponents, Rockdale. Goal kicking let them and they were defeated 21-15. The Harlequin girls continue to improve and must be close to their first win. Maybe this weekend at home against Blacktown will be their day. Tries went to Brenda Auelua, Mele Kavapalu and Jo Leupolu. The girls will play at home along with the rest of the grades this Saturday as part of the Back to Campbelltown day against Blacktown. Head ball: on the weekend the Harlequins also hosted the annual Border Cup match between the NSW Country Cockatoos and the Queensland Country Heelers.